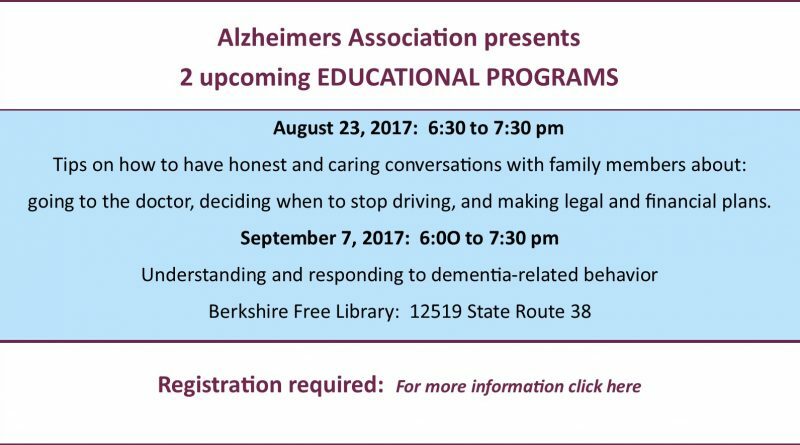 Continuing their programs about forms of dementia and Alzheimer’s Disease, a representative of the Alzheimer’s Association will be presenting programs: August 23, 2017 from 6:30 to 7:30 pm and on September 7, 2017 from 6:00 to 7:30 pm at the Berkshire Free Library. The topic on August 23 will be tips on how to have honest and caring conversations with family members about going to the doctor, deciding when to stop driving, and making legal and financial plans. To register for this program call: (607) 330-1647 ext. 100. The topic on September 7 will be understanding and responding to dementia-related behavior. Behavior is a powerful form of communication and is one of the primary ways for people with dementia to communicate their needs and feelings as the ability to use language is lost. However, some behaviors can present real challenges for caregivers to manage. Join us to learn to decode behavioral messages, identify common behavior triggers, and learn strategies to help intervene with some of the most common behavioral challenges of Alzheimer’s disease. To register for this program call: (607) 785-7852 ext 100. Registration is required at least 5 days prior to each of the programs. Unfortunately, programs with minimal registrations will be cancelled. If you do not register, you are still welcome to attend, but please call 80-272-3900 to confirm that the program is still scheduled.